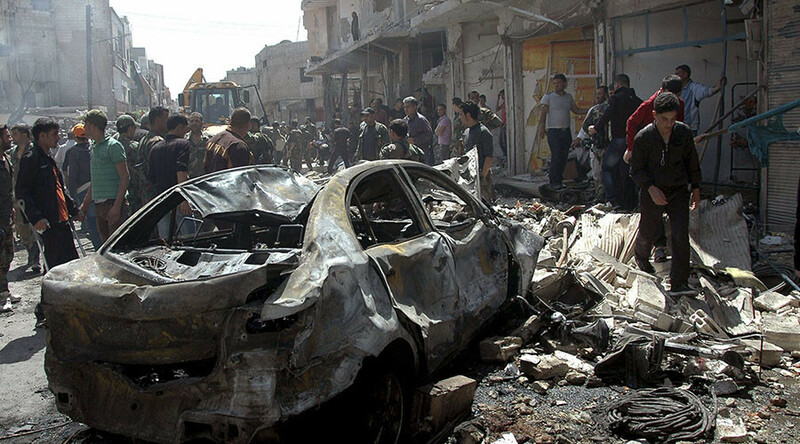 Three truck bombs killed up to 60 people and injured more than 80 in the town of Tell Tamer in Syria's northeastern Al Hasakah province on Thursday, a spokesman for the Syrian Kurdish YPG has told Reuters. The vehicles were allegedly packed with large amounts of explosives, which also caused significant damage to nearby buildings and infrastructure. “We could understand if they [the terrorists] were fighting with YPG, but they are devastating our city, killing small children, destroying houses… What right do they have [to do it]? They have no right to deprive us of our homes, to bereave children of their fathers,” a woman said in a video filmed soon after the terrorist attacks and published on YouTube by the Ajansa Hawar ANHA news agency. “[Islamic State militants] are killing innocent people… This is not Islam, this is irreligion… They have no compassion, no humanism and no feelings. They are barbarians and no single religion would accept them,” an elderly man said in the same video. The Kurdish security force, blamed the attack on Islamic State (IS, formerly ISIS/ISIL) in a statement, Reuters reports. The town of Tell Tamer is mainly controlled by Kurdish YPG fighters battling IS in this part of Syria. Later on Friday, IS claimed responsibility for the attack in a statement posted online, saying three of its fighters driving separate vehicles blew themselves up while targeting "bases" of Kurdish fighters in the town, according to Reuters. The town, also home to an Assyrian Christian community, has become a target of numerous terror attacks and incursions by Islamic State (IS, formerly ISIS/ISIL) militants over the last months. In September, IS militants organized a series of deadly terror attacks in the town of Hasakah, which killed 39 and injured more than 100. Terrorists targeted the headquarters of the Kurdish militia and pro-government forces, but most of the victims were civilians, according to TASS. In February, IS terrorists took 200 local Christians hostage and also destroyed five local churches. This caused most of the residents to flee to nearby Hasakah, the governorate’s capital city 600km from Damascus. Kurdish forces and local fighters have temporarily joined forces with the Syrian Army and cleared the region of IS jihadists. The Syrian conflict has taken the lives of more than 250,000 people, according to UN estimates. The humanitarian crisis has internally displaced more than 6.5 million Syrians and forced 4.3 million to flee the country. They have sought refuge in neighboring countries and Europe.